The perfect tool for working on fine motor and counting skills. 1. Gather your material. 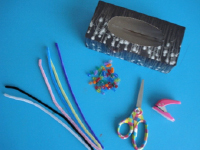 You will need an empty tissue box (choose one with pretty designs), 5 pipe cleaners, scissors, 40 necklace beads large enough to fit on the pipe cleaners (4 different shapes or colors, 10 of each), and a hole-punch or a pen with a sharp tip. 2. 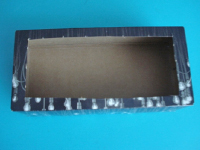 Cut a rectangle out of the top of the tissue box as shown. 3. Make four holes in one end of the tissue box. Thread a pipe cleaner through each hole and twist them so they stay in place. 4. 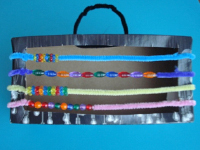 Thread 10 beads (same shape) on each pipe cleaner, counting each one with your group. 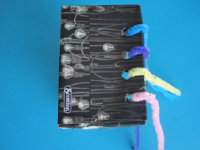 Next, punch four holes out of the opposite end of the tissue box and insert the other end of each pipe cleaner. Once again, twist the pipe cleaners. 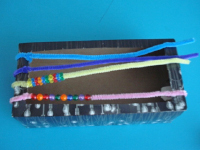 Place your pipe cleaners to create four straight rows of beads. 5. Punch two holes out of a long side of the tissue box and insert both ends of the remaining pipe cleaner to create a handle. Children will enjoy carrying their abacus around the daycare. 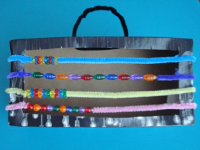 Show them how they can slide the beads along the pipe cleaners to practice counting.